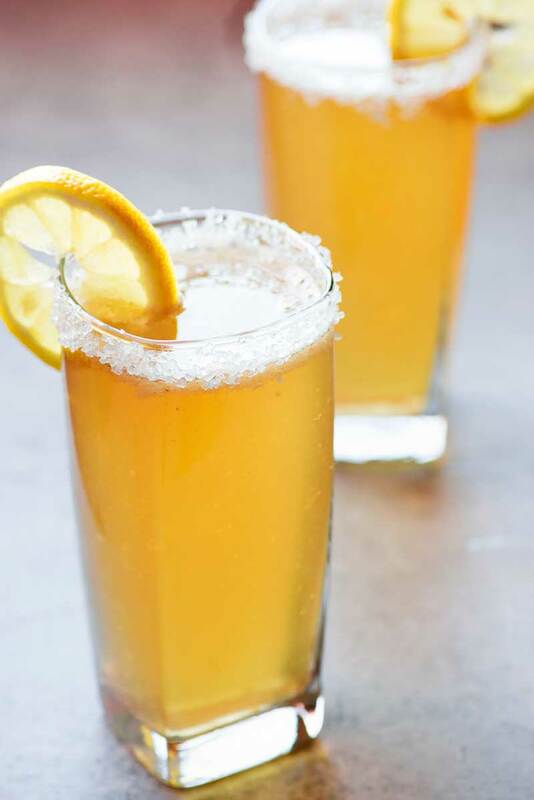 Pair your favorite light beer, ginger ale, and spicy-sweet crystallized ginger for a flavorful beer shandy that'll help you get through those hot summer nights. I don’t know if you’ve heard, but it’s hot outside. Like, ridiculously hot. And no one knows this better than my fellow Phoenicians, because this past weekend it was a rocking 120 degrees F. And it’s been hovering at or above 110 ever since then. Now, I’ll fully admit that I’m one of those crazies who likes to sing praises of “dry heat,” but let’s be real here: hot is still hot. If you can cook a steak on your driveway then you really have no business being outside. That is, until evening falls. It’ll still be warm outside, but with the sun down you might have a chance of a cool breeze rolling by. 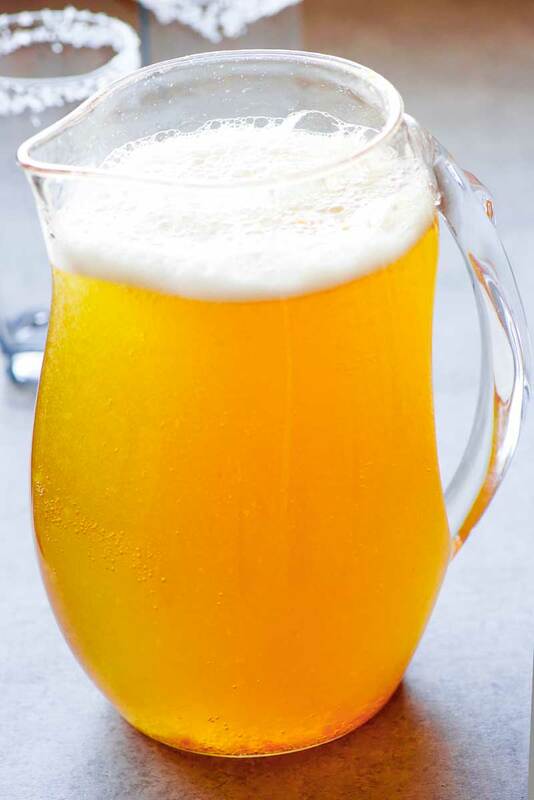 And that’s when you bring out a pitcher of this delicious beer shandy. It was only recently that I started to appreciate the wonder that ginger and beer are together. I started out small, trying my first Moscow Mule a few months back at Longhorn Steak House. So while I was browsing a special Girlling Recipes edition of Better Homes and Gardens, my eyes zeroed in on this recipe for a Ginger Beer Sandy. 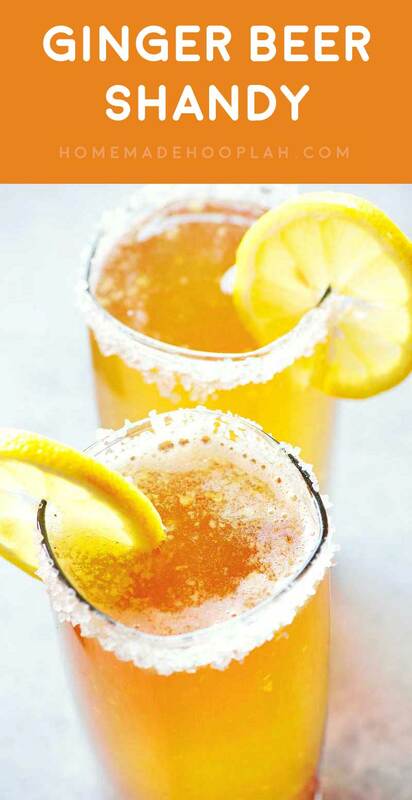 For those that might not know, a “shandy” is just beer mixed with another sweet drink. You can use lemon-lime soda, fruit juice, or (as in this case) ginger ale. Now, the namesake of this drink doesn’t just come from the ginger ale. It also comes from the crystallized ginger that’s diced up and added to the drink. It’s not a common ingredient, but you can pick some up in the spice section of your grocery store. So there I was, fresh from the store and all the ingredients laid out in front of me, and I’m giving the little bottle of crystallized ginger the side eye. I’ve had ginger before and it’s taste can be a little… harsh. And this spice bottle looked like it was filled with little golden nuggets of potent ginger. Before I chickened out, I opened the bottle, shook a few ginger crystals out, and ate them. Cause I mean, I’ve gotta taste test the ingredients, right? For the sake of the blog. And I kid you not, I had eaten half of the spice bottle before I realized I should probably save some for the recipe. Turns out crystallized ginger is a perfect blend of sweet and spicy. The soft crunch also has me popping them like candy. 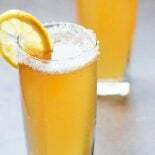 They also made a perfect addition to this Ginger Beer Shandy, making for a light and sweet drink that’s the perfect cure for this summer heat. If desired, you can cover rims of glasses with chopped crystallized ginger, salt, or sugar. Use whatever combination you like best. Dip the rims of the glasses in lemon juice and roll them in the garnish of your choice. Set prepared glasses nearby. Before making the drink, make sure you have a large pitcher nearby (about 3 Quarts). In a small bowl, add lemon juice and chopped ginger ale. Using a muddler or the back of a spoon, press the ginger to the sides of the bowl and break it apart until the lemon juice is cloudy and the consistency is like watery applesauce. It's okay if you still have a few solid pieces of ginger. At this point, you can do one of two things: you can either add the lemon-ginger mix as-is directly to the pitcher OR you can strain the lemon-ginger mixture to remove any of the solid pieces. If you use a strainer, use the muddler or the back of a spoon to press the pieces against the strainer so that you get all the juice out. Add the juice to the pitcher and discard anything that's left in the strainer. Next, pour in the beer and the ginger ale to the pitcher. Give the drink a quick stir. 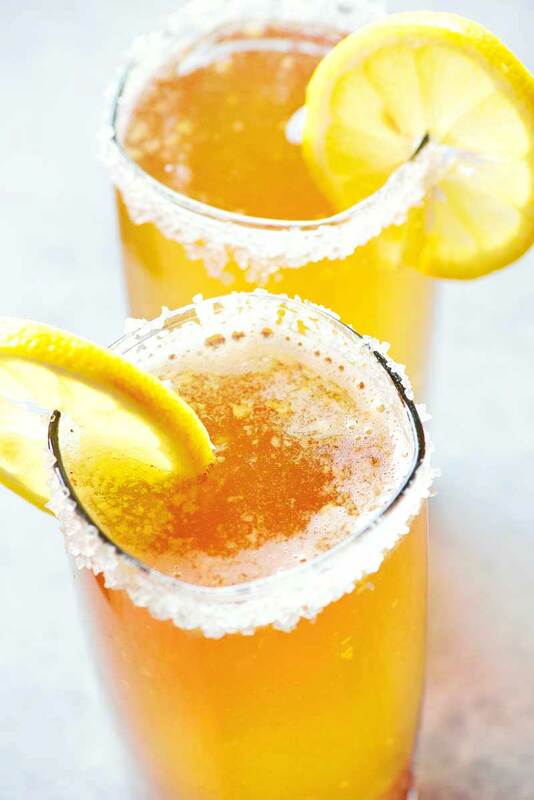 Serve ginger beer shandy in prepared glasses. I don’t drink but I’ve always been a fan of non-alcoholic ginger beer, probably from the years I lived in England, such a refreshing drink! This looks like the perfect drink for a hot summer day!